What makes flat pack houses energy efficient? Flat pack eco homes are one of the latest crazes to sweep the nation, with more and more people opting for these easy-to-assemble property options. If you want to build your own home they could be ideal, especially if you're after an eco-friendly house. Why are flat pack houses eco-friendly? A lot of companies offering flat pack houses use recycled materials in the construction of the buildings. By using reclaimed timber in the building's frame, your property will cost less to construct and will also use less energy to do so. This is because new trees won't need to be felled to create your property. Recycled rubber and reclaimed roof tiles can also be used. 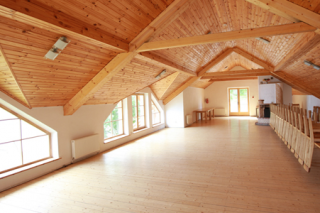 Thermal Mass Wood has an excellent thermal mass, which means it is able to absorb, retain and release heat slowly. This will keep your property nice and warm in the winter and cool in the summer, so you won't have to use your air conditioning or central heating as much. From the windows to the roof, flat pack houses in the uk come with high-quality insulation that will ensure no heat is wasted. You can choose triple glazed windows, natural roof insulation products and more to keep your carbon footprint from becoming too pronounced. The timber frame used in flat pack houses have low carbon emissions, which means they are much more environmentally friendly than other options out there. Sustainable wood can be used to set the level for carbon emissions even lower as well. Choosing a flat pack house over another type of property could help you to become more energy efficient, so you can do your bit for the planet without even having to do that much really! This article was written by Lauren Grice on behalf of Flat Pack Houses, a supplier of timber frame houses, UK eco-friendly building materials and many other products.